As my post title shows, I am only able to do a simple post today. been doing a lot of revision for my final exam on tuesday! Its my most important one so I'm trying my hardest! I will be blogging a lot :) I have so much to share!!! Its gorgeous and would be perfect for summer!!! What new summer outfits have you all got?? Also...I NEED a new layout...any advice??? Another note, first time checking out your blog and definitely not the last. I love your style, its fresh. if you've got a few seconds and like cute dresses, go to www.sway.com/acree and put in your email, it will make you a part of sway, who is launching their collection in the fall...and it sends me to vegas! i need a 1,000 girls to sign up before august, and it would mean the world to me, thanks! keep up your awesome inspiration, i've linked you on my blog roll! 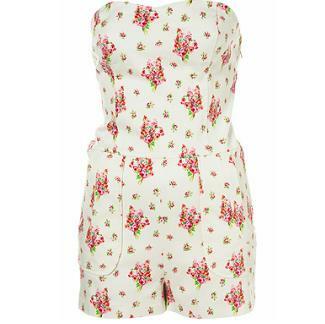 Very cute playsuit! Good luck with the exam! It's not luck, just hard work! Besides, right now I'd quite like to be a student again...you've got such an amazing three years to look forward to! I have not had any ideas for the army trousers yet I put them on the other day and was a little unsure.